For those who wonder what life is like in prison, this is a novel to read. Rachel Kushner delves into the sordid as she describes Romy Hall's life or lack of it. Raised by a ne’er do well mother and an unknown father, Romy grows up on the San Francisco streets unruly and belligerent. As a teen, she gets into drugs and booze and connects with low-class citizens. Never having any discipline or structure in her life, Romy is a wild child. While still young, she gives birth to Jackson and drifts from one seedy apartment to another while supporting herself (and her habits) working as a stripper at the Mars Room. It is at the Mars Room where Kurt Kennedy becomes obsessed with Romy and makes it his mission to follow her everywhere she goes to make sure she is safe. Romy, fearful of his stalking, decides to move away and to be closer to Jimmy Darling, a friend she feels comfortable with. "In truth, I moved me and Jackson to Los Angeles not only to get away from Kurt Kennedy but so that I could be with Jimmy Darling after he got the teaching job in Valencia. The property he sublet belonged to an eccentric old painter who was away in Japan . . .
"We would spend the night but always left first thing in the morning and made the long drive back to my own borrowed place, my so-called reality. I didn't want to live with Jimmy. He was not the sort of person you move in with, make a life with. He did his thing and I did mine, and every few days we got together and entertained each other but kept it light." Romy befriends others who are no better than she, and soon they all fall down the rabbit hole to degradation. Kennedy shows up in Los Angeles, again to stalk her and, surprised by his appearance, Romy murders him, believing her life is in danger. Without money for competent legal counsel, she receives the harshest penalty ending up with two life sentences at Stanville Women's Correctional Facility in the central valley of California. Romy finds life in prison anything but appealing as she associates with other convicts who share their pathetic stories of how they ended up there. 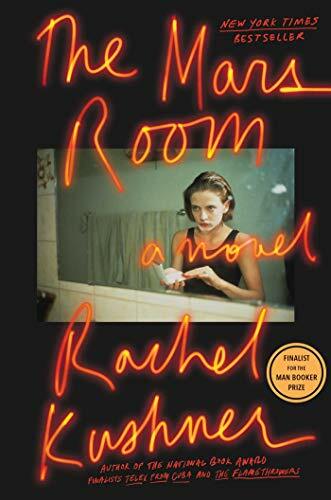 A heartrending and depressing tale of how one's life can go astray, The Mars Room delves deep into the criminal psyche as well as the workings of the judicial system and the tragic actuality of incarceration. The basis of this book is chilling and insightful, yet it is written in a disorganized manner. The reader is given insight into the protagonist's mind, though other characters are intertwined into this, some whom have questionable connections to her—and exactly what part they play in the whole scenario is unclear. Though The Mars Room is basically where Romy's life went off course, the title does not seem fitting for the context of the book. With the nitty-gritty and deprivation that can impact fellow humans and the consequences they face due to this, not much is left to the imagination. Despite this, inconsequential meanderings included, this read is powerful and moving.